\r\nand every agreement to assign or charge such benefit shall be void; and, on the bankruptcy of a beneficiary, such benefit shall not pass to any trustee or other person acting on behalf of his creditors. \r\n(1)Every assignment of or charge on a tax credit, and every agreement to assign or charge a tax credit, is void, and, on the bankruptcy of a person entitled to a tax credit, the entitlement to the tax credit does not pass to any trustee or other person acting behalf of his creditors. \r\nI believe Barclays tried to defend on these points by stating they only applied to \'legal charges\' but I\'ve not heard an update on whether it was a successful defence or not yet - personally I doubt it. 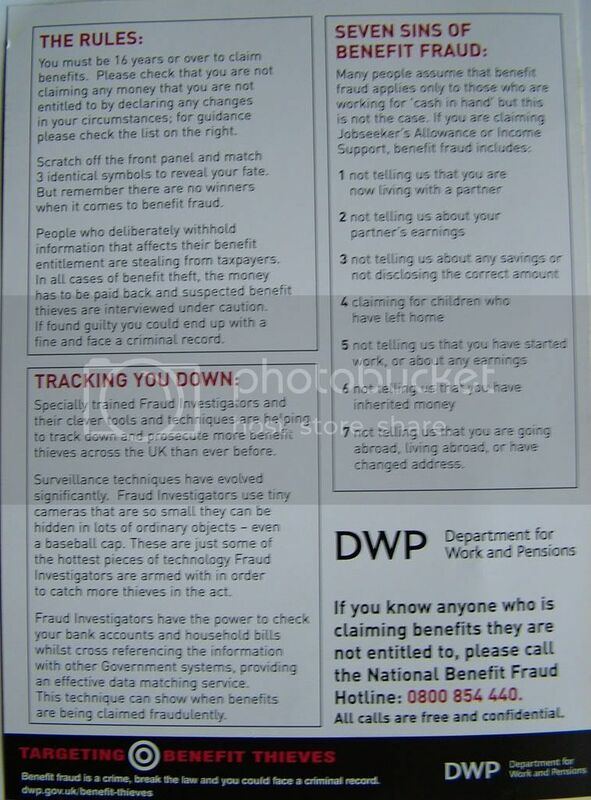 I also think it\'s concerning that those accused of fraud have their benefits stopped putting them in a catch 22 situation as not being on benefits they aren\'t entitled to legal aid. \nAlso the internal advice within the DWP is that appeals should not be considered until AFTER prosecution making it easier to gain a conviction. \nNothing to do with over here, but my daughter is between a rock and hard place with the Taxation and the equivalent of DWP back home., Neither department will talk to the other and she is being accused of ripping the system off with her child benefits claim whilst working full time. bear in mind her children are no longer dependent (all adults) and now they investigate her. tis has been going for three years and still no resolution. \nIt happened because her youngest has different surname to the others and he applied for his passport in surname instead of the name he was known by all the years, she thought it would be wiser for him to be known by the same surname. So her claims with Social services had all the kids with the same surname, but taxation has the other surname listed. She was interviewed under caution by Taxation and they still haven\'t spoken to Social Services about this, so Social Services decided to have a go at her. i told her let them take you to Court and you show the documentation to the Judge. She has paid tax all the time on all the mney she has received and earned. I also advised her to get her Federal MP involved in this. We did joke that holiday in the pokey might be just thing she needs. White collar crime gets open prison. \r\n23 years ago I had a benefit book ****** when my handbag was taken. \r\nOne slip was cashed and at my nominated post office, I applied to the DHSS and reported the loss to the police. \r\nDHSS called me in , i never thought much of it just thought it would be to make a statement like i did at the police station. \r\nMy boyfriend drove me down and I had my lad with me of 3 years. \r\nI was asked to enter a room, of course you do it thinking nothing untoward, boyfriend was asked to wait outside and he did. \r\nDoor slams behind me and 3 locks get locked, me and my lson not let out for 1/2 hour, and talk about lamp in the face interrogation 2 men both up to my face questions and shouting, why did i cash My own book and report it ******, who did i get to do it for me. \r\nit was so bad my boyfriend was banging the door. and my son was crying, at times I was stood at the door calling to my boyfriend that it was OK, but it wasn\'t it was terrifying, they wouldn\'t allow me to let my Boyfriend have my son away from the atmosphere either. \r\nI was very nervous and wary of people for a long time after and my son was very shock up, and ....benefits were never replaced. \r\n	I will not be on the internet after the end of January 2009, so will not be around as much as usuall. \r\nAnyone who wants to email me still go ahead but i won\'t be checking daily, more like weekly up the library. \r\n" the cages we live in are often of our own making"
Thats awfull Hocus, and the real crooks get away with it. That\'s disgusting gestapo behaviour Hocus... at least these days you\'d know what to do thanks to the net- Tell the world! \nSeriously with the communications we have now compared to back in the dim and distant past news like this can spread very rapidly. That alone should start making some of these stormtroopers think before abusing people. \r\nPlease consider making a donation to this site (we suggest 5%) from any charges we help you reclaim. If what we do here raises the same support that the people in the waiting area of the DHSS showed 20 odd years ago, which was disbelief in what they could hear and witnessed in sight, then its just a case of them seeing everything for them selves and it won\'t be long until all banks/government have kicked all doors in one way or another be it money hunting or human error, data abuse, miss calculation and greed. \r\nThey have all grown to large to provide any type of customer care or to control their employees, if you can\'t stop the problems then the fight continues. \r\nDSS Gestapo behavior yes definitely and id like to see them get away with that now and not be reported. I would sing from the roof tops. Last nite the following leaflet fell out of the cheap tv listings guide. 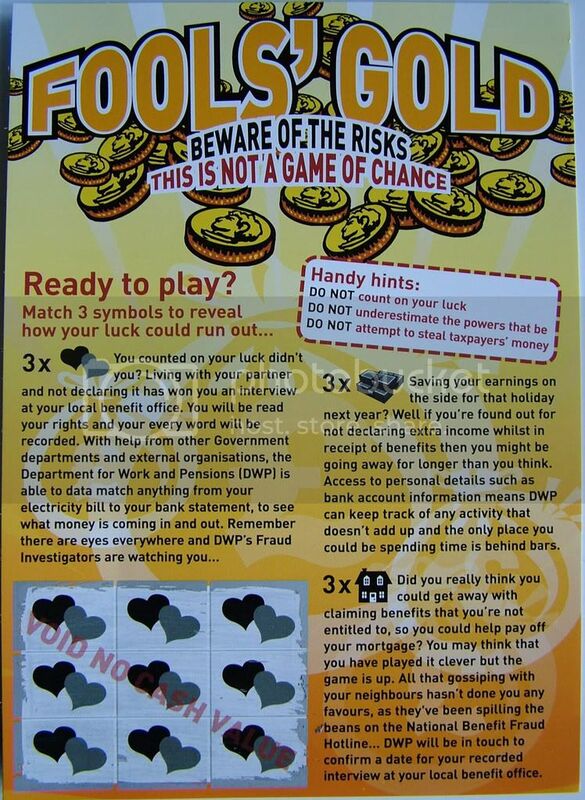 I thought it was one of those pointless scratch cards to start with until i actually read it to find out it was part of an anti-benefit fraud message from the DWP. \nTalk about police state though as they say they have cameras in baseball caps etc etc but the main problem i have with it is the suggestion that they, in some way, have the power to look into your bank account at any time?! "DWP is able to data match anything from your bank statement, to see what money is coming in and out." Is that really true?? I thought they couldn\'t do that without a court order yet they imply they can do it at the click of a mouse whenever they feel like it? Not that it matters to me personally as i don\'t have anything in there but it\'s the principle! Fraid they can since this government introduced the laws that also allow bailiffs to break into your home & assault you. \nIt\'s true that even the Stazi didn\'t have such abilities to watch it\'s citizens & when some say we are not a police state I remind them that just like the Stazi this government actively recruits ordinary citizens to inform on their fellows. There are alot of benefit cheats around. They own from a few grand upto several houses. What i cannot get is why does the dwp not get their little finger out ? Where is the line drawn thou theres to many shaded areas. \r\nLady wins lottery was a lot of millions large roll over. \r\nShe buys 2 houses and the DSS now pay her rent £700 each for them as her son and daughter live in them on the dole. \r\nJust greed who needs to take benefits when she won a roll over? my pride wouldnt let me do that, i would enjoy supporting my family independant. \r\nBut... there is no law to say she couldn\'t do it. She is lawfully exploiting a loophole. \nNow the morals of this are another thing. \nI am at a loss, because decency would not allow most of us behave in this manner and would share our good fortune with our families, without resorting to these tactic. Perhaps she should rember her Karma, and what goes around comes around. \nI for one don\'t blame her at least & it\'s also worth mentioning that her family aren\'t occupying a council home required by the local community. she is i believe also in a house paid for by our taxes. she has a bmw 107 outside on motability. Her husband has had a 57 merc in his name. What does he do ? He rents it out @ 149 per day. Sorry Lefty far from envy its just natural common sense and caring, for every £700 a month that her children "do not need to pay her" to rent those homes. \r\nA family with true problems are living in bedsits with thier children and can not rent as they can not raise the deposit to go private. \r\nThe position they are in could be any one of us who have lived with debt and almost lost our home. \r\nThe facilities are there to help catch people who truely need it and are not for it to be exploited, Its not envy wishing someone who needs a home to have one, over someone who could be given a few by thier family. What\'s that got to do with her Hocuspocus & what does it matter to you what they drive unless it\'s just jealousy of course. \nOr do you think she should use her money to fully support all of her relatives & give them housing for now\'t - I do hope not. & what does it matter to you what they drive unless it\'s just jealousy of course. I am looking at a similar scenario. Sadly Hocus, not all people in the is world are ultruistic and business is business. you and I might not do things this way, but there are others who do and that is the way of the world. \nThere will always be people who are not caught in the safety net and do you realise this is the only country that I know of which does things this way? That is the topic for another debate. \nIf I won the lottery I would help my immediate family and not the extended family and I certainly would not be responding to any begging letters. Lefty in an ideal world and if she was ultrusitic, yes. \nI stated I would support my immediate family and not the extended family. Big difference to supporting ALL the family. \nBy supporting, I would give the immediate family an equal lump sum of money. it is up to them what they did with it. That would be as far as my largesse would go. \nNice to dream, but I wont have that problem anyway. Trouble with that idea DL is that once started it wouldn\'t stop as they would lose their benefits immediately. That would be my idea, to get them off benefits and giving them the werewithall to get their lives back on track. I know I live in a parallel universe. Ha ha ha....I have my moments of cynicism and then I have my idealised world to escape back to. One major difference. Most people who are cheating do so as a means to keep their heads above water. The banks and finance industry cheat because of their avarice. IF i won the lottery my immediate family would benefit no ends and as for on going benefits that just wouldn\'t happen as money would be offered to set up businesses for them to be self sufficient. \nMy direct family members would use the offer to their best advantage and would not expect it to continue and any direct family that did surely that would only be an act of selfishness? have to wonder how some peoples direct family view there supporting direct family? \nI witnessed a conversation yesterday, a Nan that only baby sits for her daughter if she pays her with 100 fags and £10 ....there is something seriously wrong if this is what direct family is built on? \nOr may be I\'m as deluded as DL? \nOr maybe I would just dint see many boundaries when it comes to helping the ones I love build a better lives for them selves? \r\n	"The power in this country lies not with the people but firmly in the hands of the State"
There but for the grace of whtever Diety, go I.
Courtness, It would be a good idea to arrange an appointment with the CAB and see what benefits you are entitled to. Make the appointment with the CAB, just because the computer says no, it can only go on what you have filled out on the on line form, where a CAB FA will have more to hand. it still may be NO, but you will know you have explored all the avenues you can. three months sounds a long time, but it\'s not that far away.